What a deal! Along with my free admission ticket (thank you DJ Wanda), there was a coupon for a free barbecued pork rib sandwich. I was pleasantly surprised - it was a very good sandwich. 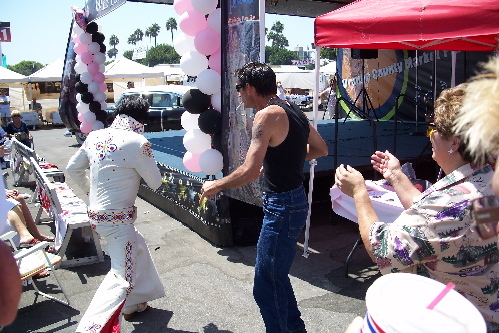 There were two stages of Elvis going on. 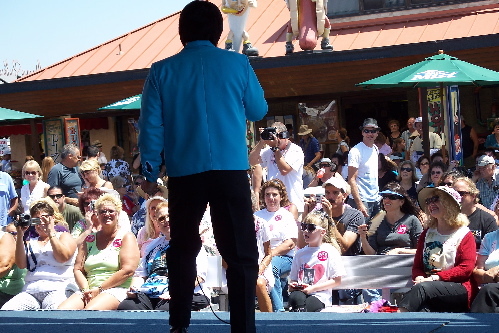 On the main "Tribute Artist" stage were the "professional Elvis's" and on the second "Karaoke" stage were the amateur contestants for the "Crème de la King" competition. Kirk Wall was obviously the star attraction on the Tribute Artist Stage. He worked the whole crowd from the stage to the snack bar and added his own unique stage patter and audience interaction. On one of his frequent jaunts into the audience, he closed in on a woman eating an ice cream cone. When she held it up to offer him some, he said something like, " I don't want your ice cream, baby, I just wanna lick your forehead." That's a good line, I may steal it. In the future, I foresee Kirk Wall impersonators. Jesse Ortega was pretty good. He looks remarkably like Link Wray. Since he has some good air guitar moves already; he should get a prop Danelectro and close his set with "Rumble." I also liked James King. He didn't go for any of that jumpsuit vibe at all, preferring the retro bowling shirt look. 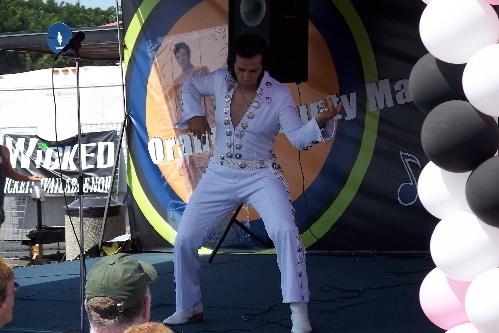 In fact he didn't do any of the cliché Elvis shtick and seemed to downplay the whole Elvis thing. He even sang obscure movie-era non-hits. I like that he threw in plugs for his current nightclub act where he not only does Elvis, but also Johnny Cash and a whole country/oldies show. 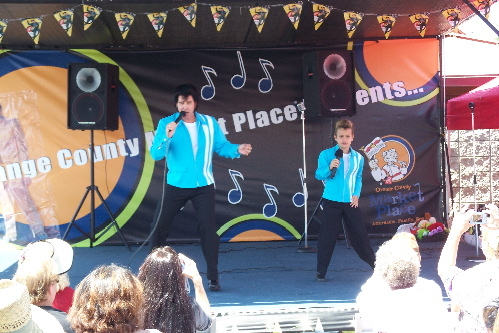 Don and Ryan Rose are the father-son Elvis. The kid seems very poised and confident onstage, but I see therapy in his future. 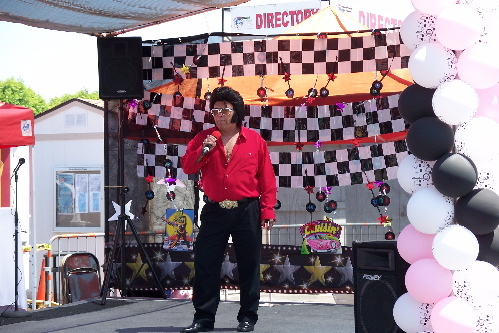 I didn't see Brutus The Elvis Impersonator Dog (In-DOG-onator?). Insert "Hound Dog" joke here. Meanwhile, back at the Karaoke Stage, things were less slick and polished. 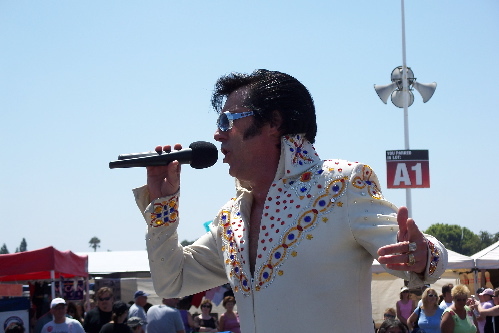 As a rule, and there were exceptions, the more the contestants tried to look like Elvis the less they actually sounded like him. The best two singers I saw were some grizzled-looking guy in a cowboy hat and a nicely-dressed older gentleman with a white mustache. The guys doing the whole big hair and jumpsuit thing were either funny/sad or sad/funny. Some of them were obviously doing it for laughs, but there were also a couple of hopeless hopefuls that were trying to fulfill some kind of dream. The Elvis well must have quickly gone dry, because at one point the competition turned into just another karaoke session. 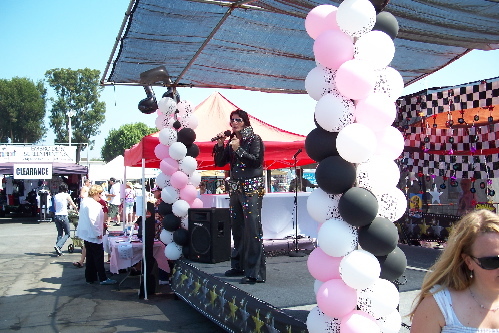 I went over to the swap meet for a while and returned to see a quite convincing Kenny Rogers impersonator onstage doing a duet with a woman singer. This guy was good - he certainly had the looks, chops and stage presence to be a tribute artist in his own right - but this wasn't "Kenny Fest" now, was it? There was also a problem with the material. Were Fake Kenny and Friend doing "Islands In The Stream" or even "Don't Fall In Love With a Dreamer?" No. They were doing that horrible Kenny Loggins and Stevie Nicks duet that I don't even know the name of. Not only was he a Kenny, but he was the wrong Kenny. 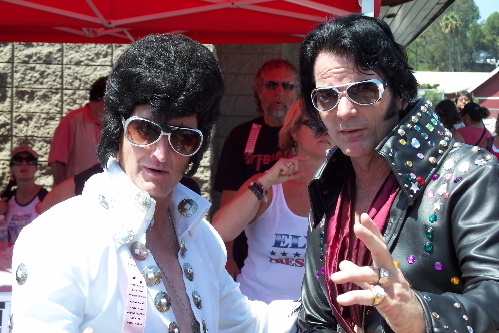 After the countless Elvis's and the fake Kenny Rogers sighting, I started noticing other doppelgangers in the crowd. I wanted the guy that looked like Dee Dee Ramone to get up on stage and do "Wart Hog" but he didn't. 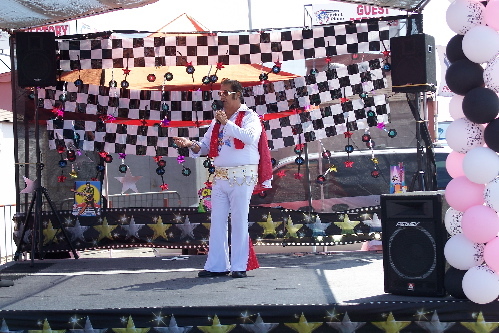 The ZZ Top lookalikes don't really count because they were at the swap meet and had nothing to do with the Elvis Fest. 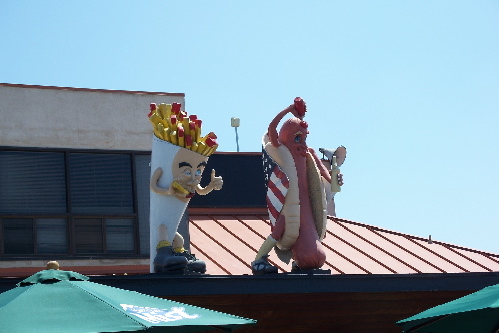 "You ain't nothin' but a hot dog, fryin' all the time"